The ancient village of Cashel in South Connemara lends its name to this beautiful Claddagh ring. This exquisite platinum Claddagh ring is set with a heart shaped diamond in the centre and is surrounded by twelve brilliant cut claw set diamonds. The wedding set includes a platinum 3 stone sway wedding ring designed to be worn with this Cashel Claddagh ring. This beautiful wedding set is Made to-Order exclusively for you by Claddagh Jewellers in our own workshop here in Galway. Claddagh Jewellers- Home of the Authentic Claddagh Ring™ - From Galway with Love! The ancient village of Cashel in South Connemara lends its name to this beautiful Claddagh ring. This exquisite platinum Claddagh ring is set with a heart shaped diamond in the centre and is surrounded by twelve brilliant cut claw set diamonds. The wedding set includes a platinum five stone sway wedding ring designed to be worn with this Cashel Claddagh ring. This beautiful wedding set is Made to-Order exclusively for you by Claddagh Jewellers in our own workshop here in Galway. Claddagh Jewellers- Home of the Authentic Claddagh Ring™ - From Galway with Love! The ancient village of Cashel in South Connemara lends its name to this beautiful Claddagh ring. This exquisite platinum Claddagh ring is set with a heart shaped diamond in the centre and is surrounded by twelve brilliant cut claw set diamonds. The wedding set includes a platinum seven stone sway wedding ring designed to be worn with this Cashel Claddagh ring. This beautiful wedding set is Made to-Order exclusively for you by Claddagh Jewellers in our own workshop here in Galway. Claddagh Jewellers- Home of the Authentic Claddagh Ring™ - From Galway with Love! The ancient village of Cashel in South Connemara lends its name to this beautiful Claddagh ring. This exquisite 14 karat white gold Claddagh ring is set with a heart shaped diamond in the centre and is surrounded by twelve brilliant cut claw set diamonds. The wedding set includes a 14 karat white gold 5 stone sway wedding ring designed to be worn with this Cashel Claddagh ring. This beautiful wedding set is Made to-Order exclusively for you by Claddagh Jewellers in our own workshop here in Galway. Claddagh Jewellers- Home of the Authentic Claddagh Ring™ - From Galway with Love! The ancient village of Cashel in South Connemara lends its name to this beautiful Claddagh ring. This exquisite 14 karat white gold Claddagh ring is set with a heart shaped diamond in the centre and is surrounded by twelve brilliant cut claw set diamonds. The wedding set includes a 14 karat white gold 7 stone sway wedding ring designed to be worn with this Cashel Claddagh ring. This beautiful wedding set is Made to-Order exclusively for you by Claddagh Jewellers in our own workshop here in Galway. Claddagh Jewellers- Home of the Authentic Claddagh Ring™ - From Galway with Love! The ancient village of Cashel in South Connemara lends its name to this beautiful Claddagh ring. This exquisite 18 karat white gold Claddagh ring is set with a heart shaped diamond in the centre and is surrounded by twelve brilliant cut claw set diamonds. The wedding set includes a 18 karat white gold 3 stone sway wedding ring designed to be worn with this Cashel Claddagh ring. This beautiful wedding set is Made to-Order exclusively for you by Claddagh Jewellers in our own workshop here in Galway. Claddagh Jewellers- Home of the Authentic Claddagh Ring™ - From Galway with Love! The ancient village of Cashel in South Connemara lends its name to this beautiful Claddagh ring. This exquisite 18 karat white gold Claddagh ring is set with a heart shaped diamond in the centre and is surrounded by twelve brilliant cut claw set diamonds. The wedding set includes a 18 karat white gold 5 stone sway wedding ring designed to be worn with this Cashel Claddagh ring. This beautiful wedding set is Made to-Order exclusively for you by Claddagh Jewellers in our own workshop here in Galway. Claddagh Jewellers- Home of the Authentic Claddagh Ring™ - From Galway with Love! The ancient village of Cashel in South Connemara lends its name to this beautiful Claddagh ring. This exquisite 18 karat white gold Claddagh ring is set with a heart shaped diamond in the centre and is surrounded by twelve brilliant cut claw set diamonds. The wedding set includes a 18 karat white gold seven stone sway wedding ring designed to be worn with this Cashel Claddagh ring. This beautiful wedding set is Made to-Order exclusively for you by Claddagh Jewellers in our own workshop here in Galway. 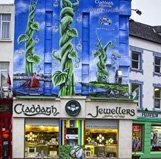 Claddagh Jewellers- Home of the Authentic Claddagh Ring™ - From Galway with Love!